In the earlier days of the internet, if you were lucky, you’d come across a website written and maintained by someone passionate and knowledgeable about a particular topic. These sites could be fantastic repositories of useful, interesting — and often obscure and arcane — facts. I found a site, musicpickups.com, that reminds me of those good old days. It’s a history of the Rowe-DeArmond company. An incredibly full history. This is what the web was made for. The DeArmond name you’re probably familiar with, and it was a relationship with Rowe’s company that saw DeArmond’s pickups, guitar effect units, and amplifiers produced and released. 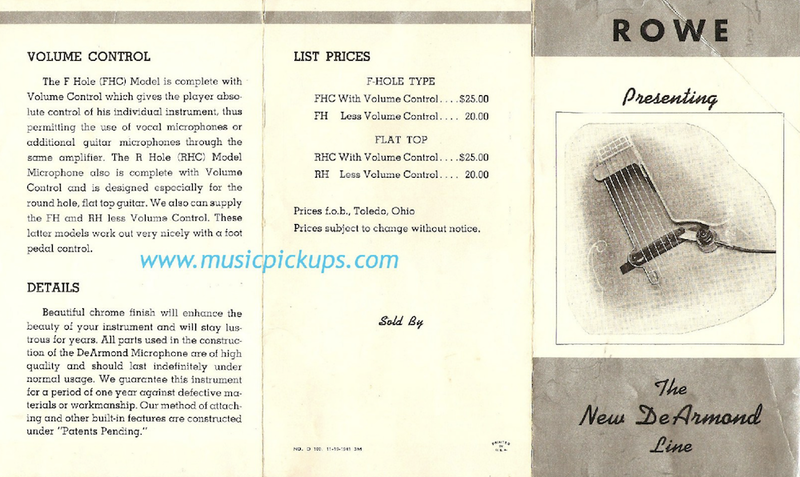 The result was stuff like this: The Model 60 Tremolo Control: The first stand-alone guitar effect. It needed to be plugged into mains power. I’m told that Billy Gibbons is a fan. And, among all the other stuff on the site are some old catalogue images. I’m a big old nerd when it comes to vintage catalogues so I was in hog’s heaven. Pity some images are a bit small but you can’t have everything. Anyway, if you’re interested in DeArmond stuff check it out. Or if you’re interested in pickups in general — there’s a great section on pickup design that’s crammed with techie detail. Or, if you’re just a nerd like me, go for it.